Homepage. This page: A collectable motoring road safety card game named after the man who brought us the Belisha Beacon. Belisha Children's Card Game from Pepys. 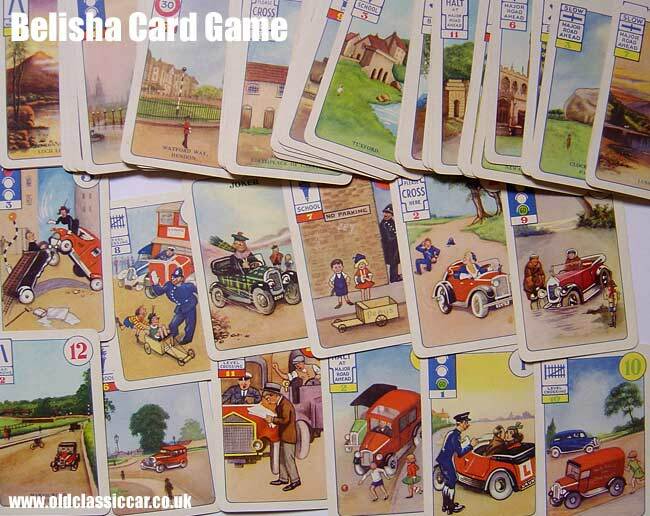 Elsewhere on oldclassiccar I've introduced the hobby of collecting old motoring & car-related games. 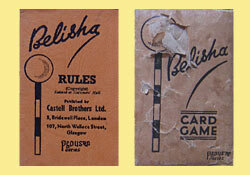 '"Belisha" is a new and improved form of the universally popular game of Rummy. It is as easy to play as the parent game but offers more scope for intelligent play and is quicker and more interesting. "Belisha" has been produced with a sincere desire to make a helpful contribution the 'Safety First' campaign. It has been carefully designed to stimulate road consciousness, especially among young people. The game was named after the Minister of Transport in the early 1930s, Leslie Hore-Belisha, who introduced the Belisha beacon - a pedestrian zebra crossing which was illuminated by a flashing yellow lamp on either side of the road, mounted on a black and white pole. Although the crossings are still in use now (they were introduced in 1934) they are rarely called Belisha Beacons any more. The cards are all illustrated with various scenes, some related directly to motoring (and shown below), whereas others contains scenes that you might come across while navigating this sceptred Isle of ours.